The post Dietitian Spotlight: Sarah Curry appeared first on Food Heaven Made Easy. The post Dietitian Spotlight: Sara Curry appeared first on Food Heaven Made Easy. I wanted to share this post real quickly in case you are looking for a new recipe to try over the weekend. We made this for lunch earlier this week. Even if it was slightly over-ambitious as a lunch project, it did tick all the right boxes for a late november meal and we are pretty sure it is something you will appreciate as well. Both Luise and I love Moroccan flavors. 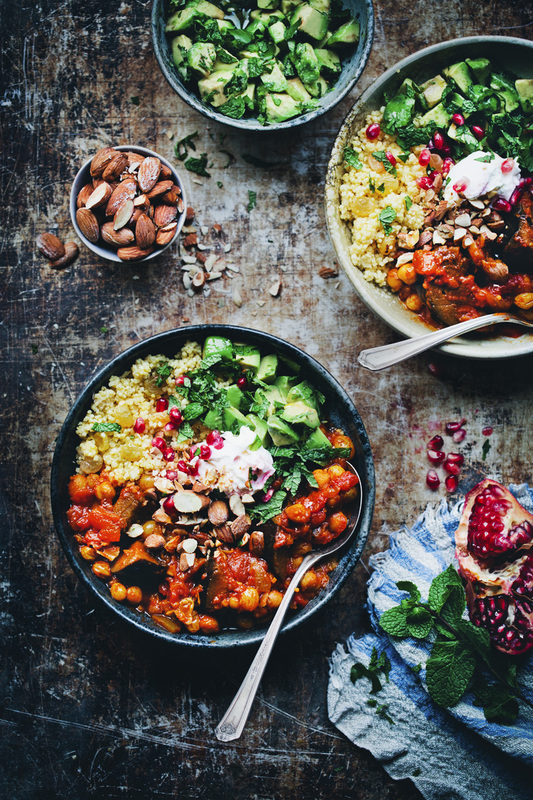 Admittedly, our approach isn’t strictly traditional, we usually just throw a whole bunch of Moroccan-ish ingredients, like mint + cinnamon + cumin + raisins + pomegranate seeds + lemon + almonds into the same dish and then call it Moroccan. That is also exactly what we have done here. 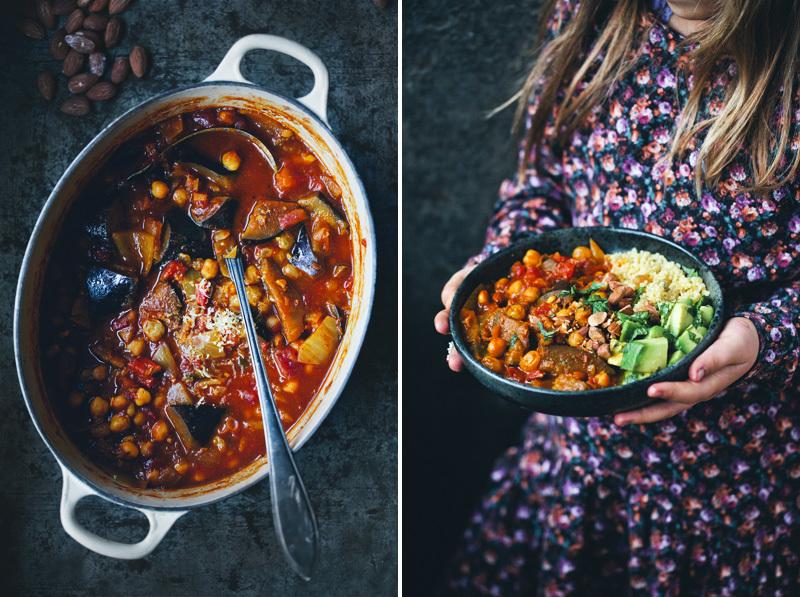 This Aubergine & Chickpea Stew is kind of like a winter version of our (favorite) Moroccan salad recipe from Green Kitchen Travels. It’s warm and comfy with large chunks of slow-cooked aubergine, super flavorful with sweetness from cinnamon, saffron and raisins, has crunchy toasted almonds on top and freshness from mint, yogurt and pomegranate seeds. If you skip the yogurt on top, it’s also entirely vegan. We have had it for lunch and dinner three times this week and we are still not tired of it (eh, well maybe just a tiny bit). Add oil to a large saucepan on medium heat. Cut the first onion in large chunks and the second one finely, along with the garlic. Add them all to the pan and let sauté for about 10 minutes or until soft. Meanwhile cut the aubergine into bite-size chunks. Add it to the pan along with all the spices and tomato paste. Let fry for 5-6 minutes, stirring occasionally. Add a splash of water or oil if the spices begin to burn against the bottom of the pan. Add the crushed tomatoes, 2 cups of the vegetable stock and saffron, stir around until it boils, then lower the heat, put a lid on the sauce pan and let slowly simmer for 30 minutes, stirring minimally. Add the chickpeas, 1/2 cup of the raisins and the last of the stock (if it looks like it’s needed) and let simmer for 15 minutes more or until the aubergines are soft and tender. Meanwhile, add the millet to a medium-sized sauce pan and dry-toast on low heat for 2-3 minutes, then add water and salt, increase the heat and bring to a boil, then reduce the heat and let simmer for about 8-9 minutes. Take it off the heat and let sit for a few minutes to absorb all the water. Add the remaining raisins and use a fork to integrate the raisins and fluff the millet. Prepare the salad by cutting the avocado into chunks, coarsely chopping the herbs and placing them in a bowl along with the pomegranate seeds. Whisk together lemon juice, oil, salt and pepper, add it to the bowl and toss. 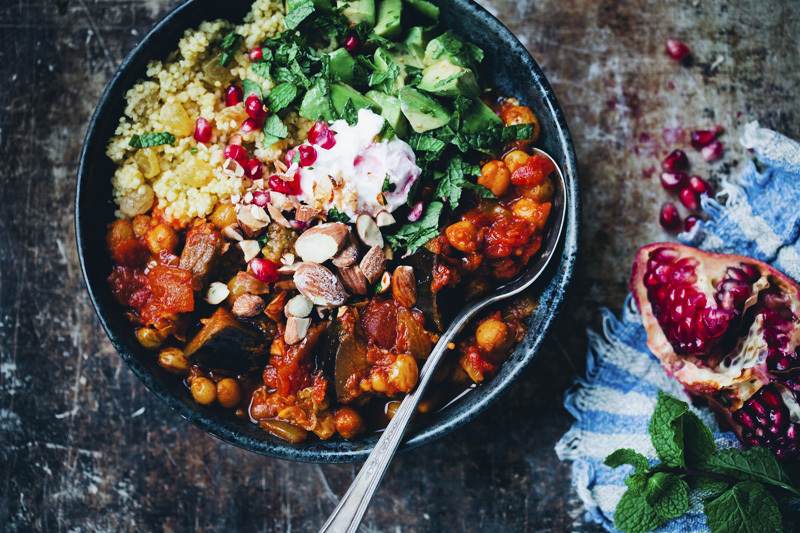 Serve in bowls with the stew scooped on top of the millet, the salad on the side and almonds, pomegranate seeds and yogurt on top. Enjoy! I love having people stay at our house during the holidays. I feel like it adds to the overall hum of excitement and gives me an excuse to cook recipes I wouldn’t normally cook for a small family. I love french toast but it’s not always the most feasible thing to make for a crowd. However, this baked pumpkin french toast takes my favorite flavors/textures and turns it into an easy meal that can feed a crowd! Read more and see the recipe. The post Baked Pumpkin French Toast appeared first on Naturally Ella.